Apple has released OS X Yosemite Golden Master Candidate 1.0 to those registered with the Mac Developer program, the build number is 14A379a. Separately, Apple released an update for Yosemite Public Beta users, versioned as OS X Yosemite Beta 4, carrying build 14A379b. Mac developers can find the OS X Yosemite GM 1.0 release through the Mac Developer Center. The GM 1.0 build for developers and Beta 4 for Public Beta users are both available as an update accessible through the Mac App Store. Downloading the delta update through the Mac App Store weighs about 900MB. Golden Master builds are typically the final version of a piece of software that ships to the public. That Apple has labeled this as “GM Candidate 1.0” suggests that it may receive another update or two before being released to the wider public. 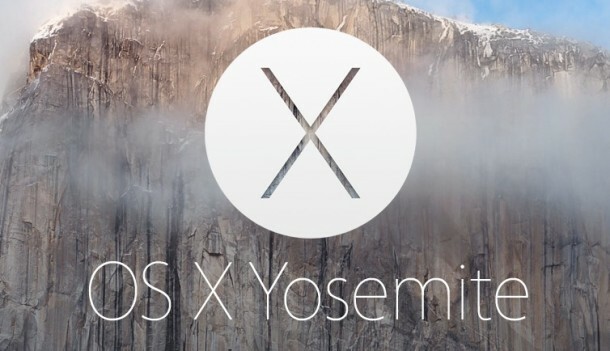 Nonetheless, the final release of Yosemite, which is officially versioned as OS X 10.10, should be due within the coming weeks. Currently, only the Developer Preview release of OS X Yosemite is actually labeled as Golden Master Candidate 1.0. Why the OS X Yosemite Public Beta release is labeled as Beta 4 remains to be seen, since both releases seem to be identical. Additionally, developers will find Xcode 6.1 GM is available to download. OS X Yosemite brings an overhauled user interface to the Mac, and includes many new features, including new abilities that aim to improve workflow between a Mac and iOS devices. Update: Both versions of Yosemite include an update to Bash shell, versioned as 3.2.53(1), to address the Shellshock flaw. Given the ‘performance’ of Apple lately, I will install this on a nonessential Mac and probably wait for OS X 10.10.1 to use it full time on production machines. I can’t obviously speak for this latest version and of course the final version but I am currently running Yosemite Beta 3 on a 5 year old Macbook Pro Unibody and a Macbook Pro Retina 15″ 2014. I can tell you they run perfectly with no bugs. Has slightly slowed my old Mac but not noticeable really, also doesn’t look as good on a non-retina screen but if you have a newish mac it will run well and look good! You are bolder than I am. I will dual boot Yo until about 10.10.5.
iOS and OSX are two different stories. Works fine on my 2 year old Macbook Air. Nice name, BTW. Weird, because I’m updating to GM Candidate 1.0 and the size is 224MB, I’m on a Macbook pro mid 2012 runing the latest Yosemite Dev Beta. I’m running the 10.10 Beta 3 in a mid 2007 iMac and my system works way better than with Mavericks or Lion. Yosemite is awesome fast. Even with transparency —but I prefer to disable it. We’ll see how well it performs once all the iCloud features like handoff/continuity/iCloud Drive are fully available on final release. iOS 8 has soured me on Apple’s software updates lately. Beta 4 fails to install with Apple store update. As with beta 2, and 3 went to software update. Clicked on install beta 4. Beta 3 was a clean install. It seemed to download fine. It then restarted. Message says installing software update. Got to about 18 minutes and did not proceed from there for over 3 hours. Are they really going to release software with this problem? Any one know a way around this problem? Sounds like you have a hardware problem, bad HD or memory. that usually causes problems with SW updates. OS 9.5 updated without a problem. HD is brand new. Public Beta 4 Downloaded super smoothly, Installed perfectly, on two Apple Computers, without issue or delay. This baby is Done, as far as I a concerned. Any bug so far ? or it is this stable and feature-complete so it could be put on a main computer ? Installed beta 4 on my macbook air 2013 and it keeps on logging off whenever i try to download anything. Well, I downloaded and clean installed Beta 4 today and everything is going swimmingly. Honestly, the only think I am disliking are the new folder icons: so ugly and way too blue. The one thing I have noticed in tinkering around is that, unlike Mavericks, Yosemite seems to use Core Storage by default for partitions. I don’t know why the change was made but it is interesting. Been running PB4 for about 36 hours on my mid-14 MBP/Retina. Definitely runs nicer than the latest Mavericks update did, but I can’t get any of the handoff stuff to work with my iPhone 6 Plus, or iPad Mini, except for call answering. BT is enabled on all devices, all are on the same network, but no good on handoff. As I typed that, I just realized that my MBP is on the 5GHz antenna of my airport, while the others are on the 2.4GHz. Gonna move the MBP over to the 2.4 to see if that has any effect. Beta 4 Been a nightmare for me, first time update froze had to go to recovery mode and restore from TM. Second time installed smoothly but after opening new apps, trying to print machine basically auto logs me out, log back I and restarts all my open apps. Tried reinstalling twice and same issues. TM back to Beta 3 which runs smoothly on my machine, 2014 MacBook Pro retina. Can’t even feedback to Apple as the feedback software causes sand issues. I have the exact same problem with Beta 4 on my MBPr 13″ Late 2013 (Haswell). After installing Beta 4, I am auto-logged off for any seemingly random action – swiping touch pad, closing an application, minimizing a window, and especially trying to submit feedback. After about several attempts on the feedback submit screen, I just saved the feedback as a draft so that I wouldn’t have to retype it over again. It is almost like someone is playing a practical joke on the beta tester – sabotage the feedback submission feature. I contacted Apple tech support and they were really helpful especially since I was calling about a Yosemite problem. They advised I re-install Yosemite Beta (download again via App Store > Purchases) Beta and update to version 3. This is too bad as I have not had any issues until the version 4 update. I am glad/sad to see that I am not the only one. Still love Apple though…and this is part of a beta tester’s role. It would be interesting to know what is causing the problem. I have exactly the same problem with the beta 4 on my macbook air 2013, It keeps on logging me off when i try to download or save anything. I even tried to download the old OSX mavericks on apple store but logged me off. How can I downgrade to beta version 3?? I was able to restore via Time Machine to Beta 3. If you do not have a backup, you may have to do a recovery by restarting and press Cmd + R.
If you try to reinstall, it may reinstall with Yosemite and auto-update to Beta 4 (this happened to me before I did the restore via Time Machine). Simply cannot get the PB4 to download and install. Keeps asking to restart within a minute of starting the download, then leave a line in the installed updates window (about 10 so far) but I am no closer to being able to test it.